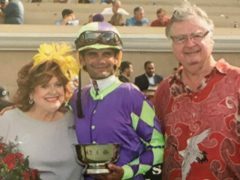 As Rick Waller watched the Sorrento Stakes field approaching Del Mar's starting gate, trainer Phil D'Amato's excitement was just starting to catch on. The excitement built as the race went off, and the owner was afraid to hope as 10 juvenile fillies flew down the backstretch, but the little chestnut he first saw at six days old had plenty to give. Spectator powered down the stretch to a 5 ¼-length victory, finally proving his faith had been warranted. Now the winner of both her career starts by a combined 10 ½ lengths, Spectator's Grade 2 triumph is the first graded stakes win of owner/breeder Waller's 25-year career. It's been a long time coming. The journey first began when Waller was a young boy watching his father bet on the racehorses on the weekends, but his own passion for the game wasn't kindled until years later. When Waller proposed a first date at the Pomona County Fair races to the woman who would become his second wife, little did he know that her brother was long-time jockey Richard Beasley. That date certainly helped seal the deal with Sharon. A dozen years later, it would also kick-start Waller's interest in the breeding industry. In 1995, Beasley was ill with a brain tumor. He asked Waller to take on a mare he owned — to not let her bloodline, tracing back to Bold Ruler, end prematurely. It wasn't long before Waller was reading every book he could get his hands on about Thoroughbreds and breeding. He studied the names in the bloodlines of every stakes winner printed in the rear of the Blood-Horse magazine each time it arrived at his home, searching for patterns. In 1998, he bought a mare named One Stop at the Barretts January mixed sale after she failed to reach her reserve. By Mr. Leader (Hail to Reason) out of My Gidget, by Liloy, her bloodlines traced back to Bold Ruler as well. A cross with Swiss Yodeler, the multiple graded stakes winning juvenile, produced Waller's first “big horse.” He named her Swiss Diva, and she won her first three starts in a row in Southern California, including the 2006 California Breeders' Champions Stakes by a striking 8 ½ lengths. Unfortunately, Waller said, Swiss Diva didn't take very well to the all-weather surfaces that took over Del Mar, Hollywood Park and Santa Anita the next year. He believed she could have won a graded stakes on the dirt, but she ended up pulling a suspensory after producing $240,000 in earnings. She was his favorite mare, and he decided to breed her to Henny Hughes for her first foal. Tragedy struck, and Swiss Diva died of a ruptured cecum during the foal's delivery. Waller named the resulting filly Diva's Tribute. Misfortune struck again quickly. Diva's Tribute was placed on a nurse mare and was found at a week old with a broken hock. She'd never race, but as the only reminder of his favorite mare, Waller wanted to save her. He was advised to let it be until she grew a little, and the filly successfully underwent surgery to remove a displaced piece later on. Waller had to wait until Diva's Tribute turned three to breed her. It was before Into Mischief's blockbuster success as a sire, and he bred his prize filly to the young stallion for $20,000 in 2013. This would have the resulting foal inbred four by four to Storm Cat. There were early problems between mother and daughter, however. Just a few days after foaling, Diva's Tribute savaged the young filly, tearing away a chunk of her neck near the withers. Devastated once again, Waller was determined to do the right thing by the foal. Hagyard's Dr. Robert Hunt was able to repair the worst of the damage, and he relayed that the filly had a strong will to live. Dr. Hunt prepared specialized “clothing” with padding to cover the areas at her neck which left nerves and vertebrae without muscle and vulnerable, and the filly thrived with her nursemare. Still, she would never race. Following a recommendation from pedigree analyst Ann Peters, Waller bred Diva's Tribute back to Jimmy Creed. A single line of her report convinced him of the right match for his prize filly. This time, the filly was taken away from Diva's Tribute immediately after foaling, to prevent the tragedy from happening again. Anxious to see her, Waller and his wife traveled to Kentucky when she was just a few weeks old. She was taller, with more leg than her half-sister, Waller said, but her image evoked all the right memories of her granddam. Sent to Harris Farms for breaking and training, Spectator was a star at the start. “She never did anything wrong, never missed a beat,” said Waller. “She was just solid from the very beginning. She didn't like to work with other horses, so she'd outrun them. Once she got to the racetrack, D'Amato had to start breezing her with older mares, and eventually even colts. Now that Spectator has proven herself with two impressive victories, Waller finds himself grateful for his perseverance with the family. Many, many people had questioned his persistence over the past years, even his wife, but he never gave up. 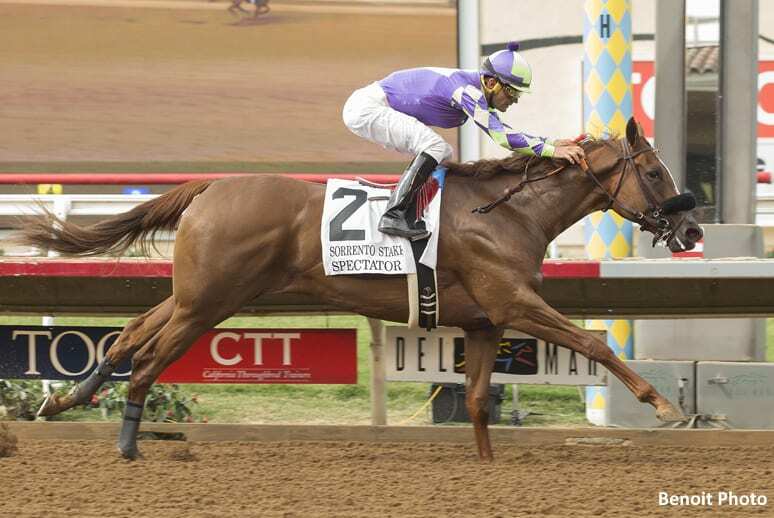 This entry was posted in Connections, NL Article, People and tagged Breeders' Cup presents Connections, Chelsea Hackbarth, Connections, Del Mar, Phil D'Amato, Rick Waller, Sorrento Stakes, spectator by Chelsea Hackbarth. Bookmark the permalink.